Tempting children away from playing video games is no mean feat, but the benefits of playing in the great outdoors are too numerous to list! If you are lucky enough to have a backyard or garden it would be worth considering making the area more appealing for your children. If they can simply open the door and find things to do in their own backyard they may start to view spending time outdoors a joy rather than a chore. The design of your garden is key to making it an inspiring place to play as well as somewhere for you to chill out at the end of a hard day! Your design will also very much depend on the age of your children. If you have teens you may wish to create a space for playing basketball or tennis, if your garden is large enough you could even find space for a basketball court construction. If you have young children you may wish to designate an area for play equipment such as a climbing frame and maybe a sandpit. 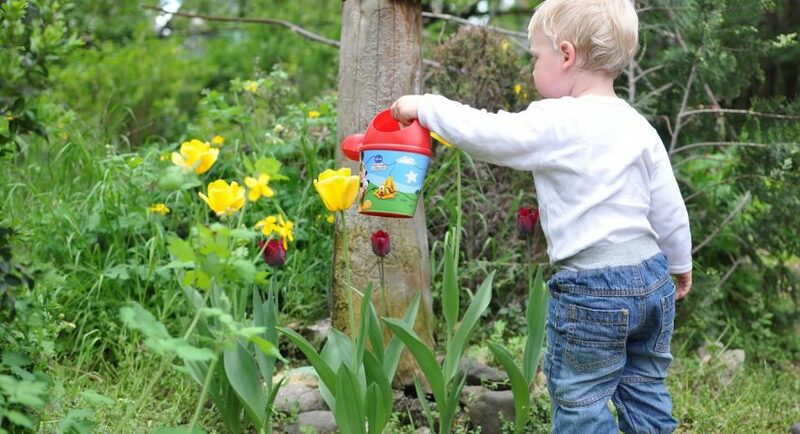 Here are some ideas for creating a child friendly garden. Your first step is to look at your available space. You should divide your garden into designated zones. An area for play equipment should be sited in view of the house, whereas teenagers may crave a little privacy. You could consider constructing a summer house as a chill out zone. Children love to learn about nature, so look at making a vegetable patch and a bird feeding station. Don’t forget to plan a seating area for yourself! Look at which way the sun sets and rises in your garden so that you are aware of the shady areas and areas that are in full sun. Try to purchase play equipment that will grow with your child. Children grow so fast and the expensive playhouse you bought for their fifth birthday may be too small by the time they’re seven! Climbing frames and swings usually stand the rest of time and remain popular for many years. A trampoline is also a good investment as very young children and teenagers love them alike. Consider positioning your play equipment on soft ground or bark chippings in order to lessen injuries from falls. A garden needs plants and flowers to bring it alive. The colours of flowers and the calming greens of foliage are beneficial to young and old alike. Choose plants that are easy to grow and maintain, also plants that don’t mind being bashed by the occasional football. You could also choose flowers that are aromatic such as roses and sweet peas, as well as smelling lovely they will attract bees and insects. Check that there are no poisonous parts of the plants before planting. You could plan a sunflower growing competition for the whole family to participate in. The tallest flower wins! Children will learn how to grow and care for plants in this activity and will get them outside to water the plants. Fussy eaters will be tempted to eat a wider range of foods if they grow them themselves. If you only have a small amount of space, many vegetable varieties can be grown in pots. Great vegetables to try include beans, salad leaves and tomatoes. You could also grow a selection of berries which are always popular such as strawberries, raspberries and currants. Hopefully the above tips will tempt your children away from their Playstation to enjoy the benefits of spending time in the great outdoors.